A few weeks ago my boyfriend and I decided to spontaneously go to Rotterdam for a day. We first had a yummy seafood lunch at Hotel New York and then walked around the city centre for a bit. A lovely day except for the rain which was pouring down all day! In a few days I'll finally be re-united with my friends and my favourite city in the world. It's my last year as a student in London so I must make the most of it! With inside this beautiful card holder. So unexpected which made it all the better! I love this bouquet I made. Beautiful blues, whites and some green. I also added fresh mint leaves which adds a fresh scent to the bouquet. I'm trying to enjoy the flowers as much as I can before the season is over. I bought this little pot of almond butter at Whole Foods a few weeks ago. I had made almond butter myself before but this is so much better. It contains 99.5% almonds and 0.5% salt, which makes it slightly salty. I ate it with sourdough bread, but also spooned it right out of the jar (don't tell anyone). This jar was empty within 3 days so I'm not the only one who loved it;) First thing I'll be buying when I'm back in London. 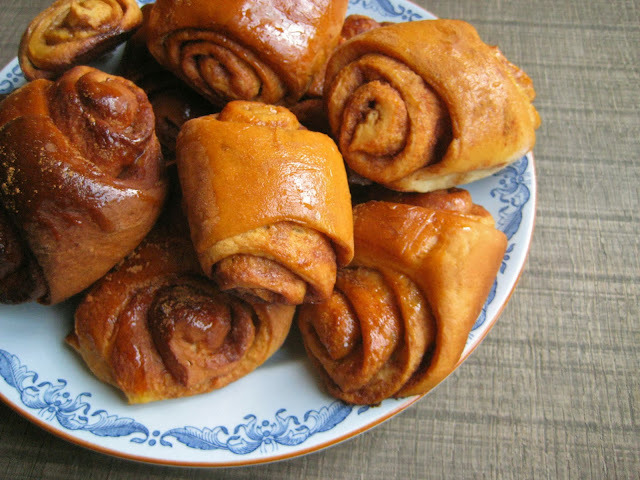 Like I promised a few posts ago, I tried to re-create the cinnamon buns from the Nordic Bakery. I think it turned out pretty well, except next time I need to take them out of the over sooner. When I've fine-tuned the recipe I'll post it here!